Do you know how to practice a chakra meditation? Here is a simple 8-step guide to practicing chakra meditation (And don’t miss the short video at the end of this article on How To Awaken Your Chakras). But first, what are chakras and what role does the chakra system play in our mental, physical, and emotional health? There are seven chakras, or major energy centers, in the human body. Chakra is a Sanskrit word which means “wheel”. The chakras are similar to wheels in that they are spinning vortexes of energy. They are centers of force located within your body, through which you receive, transmit, and process life energies. Each chakra is recognized as a focal point relating to spiritual, physical and emotional energies. The chakras are the network through which your mind, body, and spirit interact as one system. The seven major chakras correspond to specific aspects of our consciousness and have their own individual characteristics and functions. Each has a corresponding relationship to one of the various glands of the body’s endocrine system, as well as to one of the seven colors of the rainbow spectrum. The main purpose in working with the chakras is to create wholeness within yourself. In this way, you bring the various aspects of your consciousness from the physical to the spiritual, into a harmonious relationship. Ultimately, you will begin to recognize that the various aspects of your being all work together, and that each aspect is as much a part of the whole as the others. A big part of meditation is learning how to acknowledge, integrate, and accept all levels of your being. Think of something as simple as your bathtub drain. If you allow too much hair to go into the drain, the bathtub will back up with water, stagnate and eventually bacteria and mold will grow. So is too with our bodies and the chakras. A bathtub is simple; it’s physical so the fix is easy. Keeping a chakra open is a bit more of a challenge, but not so difficult when you have awareness. Since mind, body, soul, and spirit are intimately connected, awareness of an imbalance in one area will help bring the others back into balance. Chakra meditation begins by sitting in a comfortable position with your spine straight, but not ridged. You then want to focus on each part of your body starting with your feet and working up. As you do this, have that part of the body relax and let the stress melt away. The next step in chakra meditation is to focus on the breath. Do not force it, but let the breathing become steady and deep. The mind will most likely wonder, just gentle bring it back to the breath and maintain the focus on each inhalation and exhalation you take. Visualize the oxygen coming into your lungs and passing into the bloodstream. Visualize it nourishing all the muscles, organs and cells of your body and then see it removing the toxins from your body which you expel with each breath. Next in chakra meditation you want to visualize the beating of the heart and the perfect function of the body. See how all the parts work together in complete harmony. See how the breath sustains all these parts and the body as a whole. Become aware of how the breath is the life giving force of the entire organism you call your body. Next in chakra meditation you should imagine a life giving energy that you are breathing in along with the air. See this energy as a yellowish orange color. See this energy encompass your entire body and infuse your aura. As this energy infuses your aura, imagine the aura growing stronger, brighter and being charged with this incredible energy. Do this step gradually, let the aura grow brighter little by little and keep this energy flowing in with each breath. 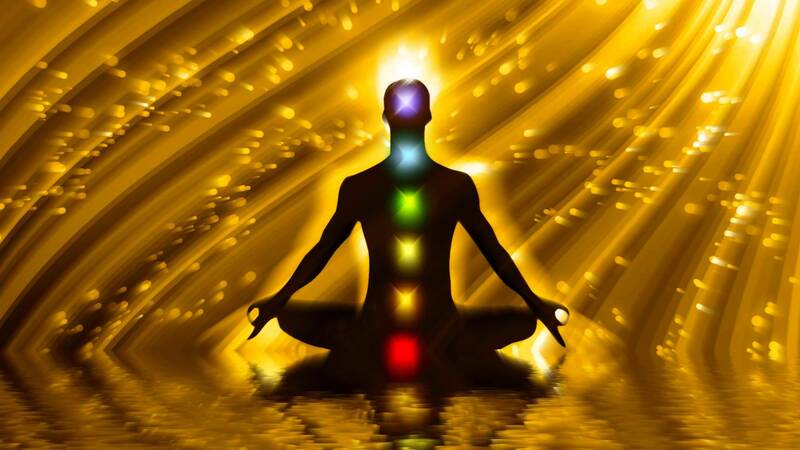 The next thing we want to do in chakra meditation is energize each individual chakra. Start with the root chakra in the lower back. Imagine a clockwise swirl of energy and the energy you breath in feeds this swirl and makes it strong and brighter. We want to next imagine another source of energy that is coming up from the earth. This is the same life giving energy and it adds to the swirling energy at the root chakra. Next in chakra meditation we want to move up to the sacral chakra. Then one by one the solar plex chakra, heart chakra, throat chakra, head chakra and finally the crown chakra, infusing each with the life giving energy. Take your time with this and do not worry about spending more time on one chakra if you need to. It is strongly advised to always work from the bottom, going up and not skip around. Each chakra will influence the other chakras and energizing a higher chakra before a lower chakra could have an adverse effect. The last step in chakra meditation is to visualize all the chakras at once being feed by this energy coming in from the breath and up from the earth. Remember to see the chakras and your aura become brighter, clearer and super charged from this life giving energy. Finally we can open our eyes and relax a couple minutes with our eyes open. Pay attention to your body and how incredible and energized you now feel. Try to practice 15 – 30 minutes each sitting. Enjoy, this is a really good, uplifting chakra meditation. If you want to learn more about how to work with your chakra system, here is a short video on How to Awaken Your Chakras. The post 8 Steps to Practice a Chakra Meditation appeared first on About Meditation.